For auctions, the wound this photograph suffered would probably prevent it from being sold. But for this particular photograph, the damage probably has greatly increased it’s value. Photographs are delicate - they are works on paper. Even the slightest crease or indent mark will reduce the value of a photograph, or even make it worthless. A photographic print is incredibly delicate in one sense, but then you see this image of the aftermath and 90% of the Serrano’s photograph is unharmed. 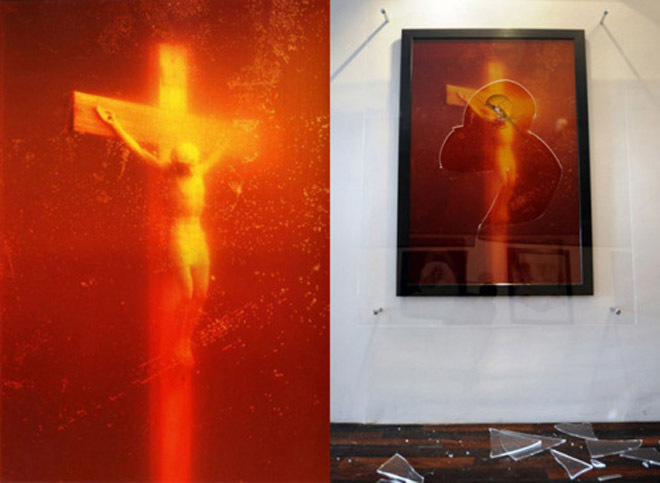 Ironically, the “Christ” has been defiled, leaving the “Piss” alone. Certainly it’s a frustrating time to be a Christian extremist. These men must regularly consider that 700 years ago their predecessors were able to lay waste to vast sections of the European continent, burning entire cities of non-believers. Today, they are not even able to fully “destroy” a single piece of paper. Besides swinging a hammer wildly, how do you destroy a photograph? This is where paragraphs can be spent discussing negatives, edition sizes, what is the real work of art, and whether a low resolution reproduction on the internet counts as a photograph. Do the true believers spend millions over decades to buy every extant print, perhaps wait for the artist to die and buy his estate for the negatives? The problem with this approach is that the more the profane is fetishized and rareified, the more it seems sacred. Perhaps the only way to silence a photograph over the next 100 years is to be silent about it.